It’s a sunny afternoon on the Morningside College campus. I find myself walking alongside Tori Anderson after a choir rehearsal over to the cafeteria for dinner. We make casual small talk on our way over, just the general “how was classes today?” or “that rehearsal was brutal” as we normally discuss. Suddenly as I begin to complain about choir, she slaps me on my chest and tells me to hush. She points, and right before our eyes there’s a small corgi getting walked on the campus mall. For the next minute or so the only words coming out of her mouth are “I love you” and “you’re so precious”, as she stared at the dog. From this point on, it became very clear that Tori was a dog fanatic. Tori Anderson is a junior Non-Profit Management student at Morningside College from Sioux City. She is a member of the Morningside College Choir, the Vice President of MAC, the secretary of Student Government, and an RA in the Plex. In many ways, her love for dogs has bled into her activities. Examples include her heavy involvement in animal-related MAC events and using images of corgis as name markers on her residents’ doors. Even her laptop and cell phone backgrounds feature golden retriever puppies. Tori recalls always having a love for dogs. “I’ve always thought dogs and puppies are so cute. They’re almost too precious for us people”. 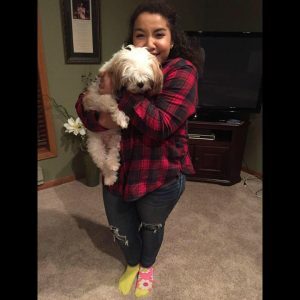 She is so in love with dogs that she has stated that her biggest fear is “finding a dog that doesn’t like me.” While she loves all dogs, she states that her two favorite breeds of dogs are golden retrievers and corgis. Instances such as seeing the corgi on campus are not irregular. As these can happen almost anywhere with any dog. During my time with Tori, we both saw a German Shepherd getting walked around the Sioux City Rose Garden. This time, the dog and the man walking it approached us. Instead of her usual staring and softly saying that she loves the dog, she asks the owner if she could pet it. Sure enough, she gets permission and then spends the next few minutes petting the dog, asking the owner any question you could think of about the dog, and making sure the dog knew that it was precious and that Tori loved it. When asked about her encounters with dogs, she made it very clear that “I have never seen a dog before that I didn’t love.” While Tori loves many things in her life, such as her family and friends, music, and life itself, it is very clear that her biggest love is for dogs.